Thanks to an outstanding amount of support from YOU, last year’s event was a huge success! We are happy to announce the event is back again. 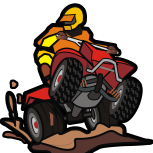 ROCK RUN ATV SUMMER BLAST 2017 will be August 10-13th. Children 12 and under are always FREE and Adult ticket discount pricing is available until March 31, 2017. Camping passes are now available for purchase. Camping will be Thursday, Friday and Saturday evenings. Sorry, but we are not offering Sunday night camping. All camping sites are first come first serve, so make your reservations now!